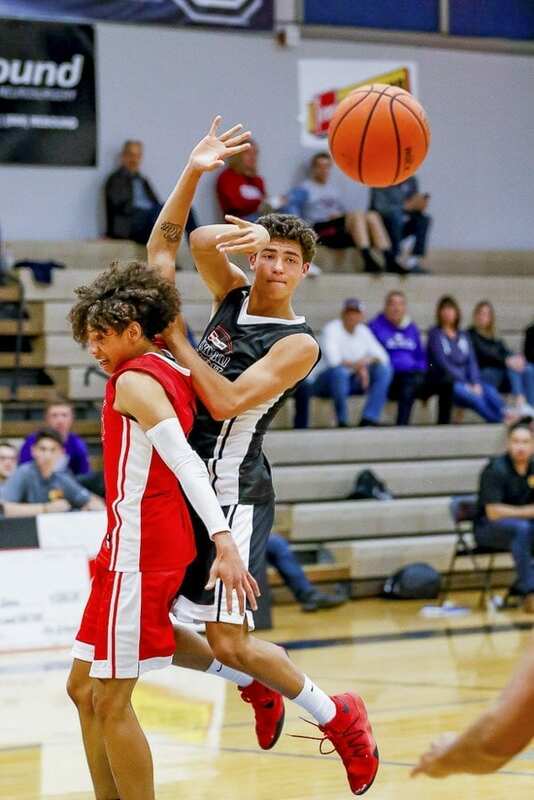 La Center’s Taylor Mills arrived to Roundball Shootout after Celebration of Life; Camas’ Tre Carlisle shined in boys game. VANCOUVER — It was so much more than an all-star game for Taylor Mills. It was a chance to shine on the day her family said goodbye to her grandfather. 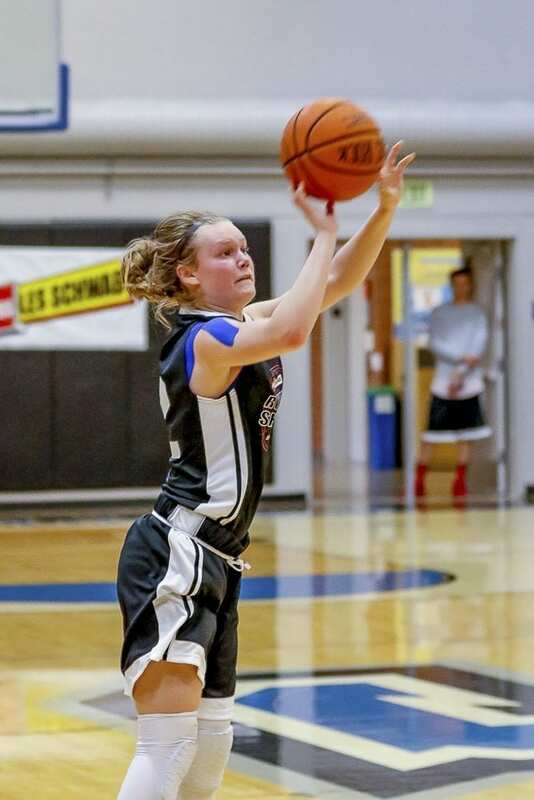 That smile she displayed Sunday night after winning the MVP award — The Star of Stars — at the Les Schwab Tires Roundball Shootout had so much more meaning behind it than from just another good day on the basketball court. Mills, one of four La Center Wildcats to play in the girls game, scored 24 points to lead the Black Jerseys to a 58-51 victory over the Red Jerseys. 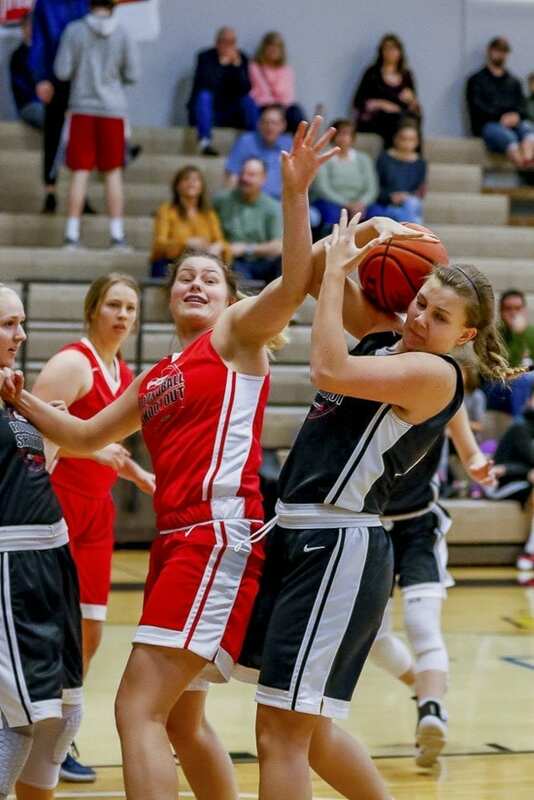 This was the 23rd Roundball Shootout, an annual showcase of high school seniors from Southwest Washington. Later in the night, Tre Carlisle of Camas got to display his scoring skills, totalling 20 points to take home the MVP of the boys game as the Black Jerseys rolled to an 87-56 win at Clark College. Mills and her family were in Tigard, OR, earlier Sunday at the Celebration of Life for Jerry Mills. It almost did not happen for Mills. At least not on time. Traffic was unusually heavy on I-5 for a Sunday, and Mills was running late. “It was stressing me out,” she said. She did not look out of sorts on the court. She arrived just in time for a few warm-up shots, then scored 10 of her team’s first 15 points. She ended up with 12 in each half. She also had the score that put her team in the lead for good in the fourth quarter. “My teammates just kept passing me the ball. I’m really grateful to them,” Mills said. It was a home game of sorts for Mills, who is expected to play for the Penguins at Clark College next school year. This was her final organized high school event. “I just realized that,” she said, adding that it was a “great way” to end her career. Another La Center Wildcat, Molly Edwards, is still recovering from an injured shoulder she suffered at the state tournament. Looks like the recovery is coming along just fine. She made six 3-pointers to score 20 points for the winning squad. No surprise, after the game, Edwards won the girls 3-point shooting contest. 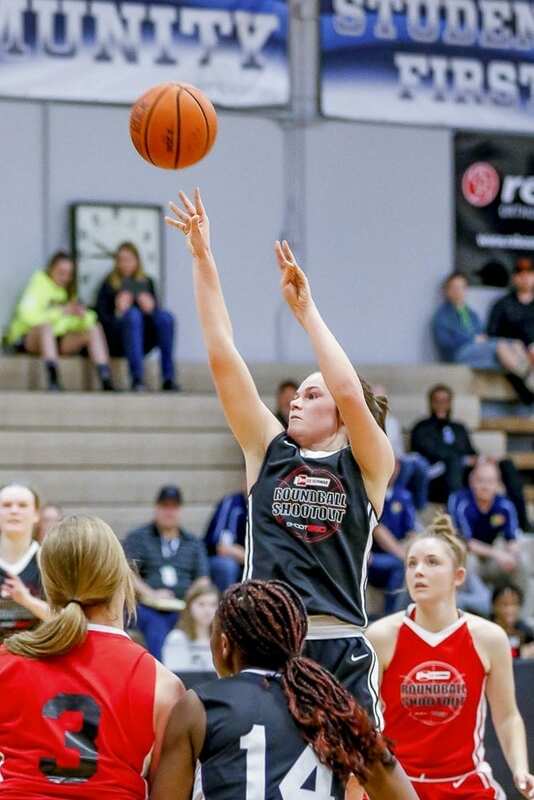 Hockinson’s Payton Wangler made four 3-pointers and led the Red Jerseys with 16 points. In the boys game, Carlisle had 14 of his 20 points in the first half as the Black Jerseys jumped out to an 18-point lead. His performance was a little bit of vindication for Camas basketball. 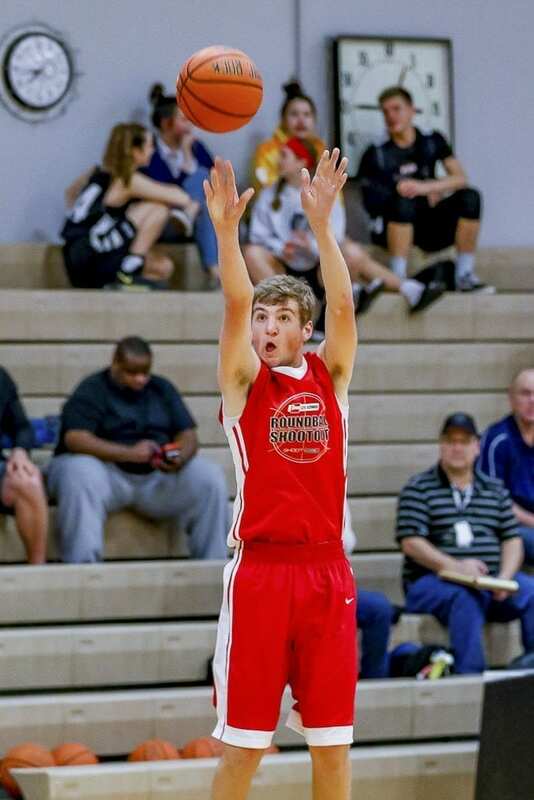 Camas teammate Ben Cooke added 15 points for the winning squad. Carlisle said it still hurts that the Papermakers did not make it out of Clark County for the postseason. “To come out here, it was really cool to get the joy of playing basketball again instead of ending in that disappointment,” Carlisle said. Plus, his role with the Papermakers was not that of being a scoring machine. He was a rebound and assists guy, he explained. No need for roles in an all-star game, though. Evergreen’s Brock Schoene put on a display, too. He made five 3-pointers for the Black Jerseys, including three in a row in the fourth quarter. He finished with 17 points. Columbia River teammates Nasseen Gutierrez and Jacob Hjort each scored 13 points for the Red Jerseys. Evergreen’s Jeremy Harju added 11 points and had the dunk of the night. Prairie’s Dante Heitschmidt won the boys 3-point shooting contest.